This was a strange week, generally positive until Friday, when trade war announcements caused most assets except the USD and long term bonds to drop sharply. Bitcoin and Ethereum had fallen hard very early in the week, and were recovering slowly before giving up their gains on Friday, ending off 14.5% and 17.5% respectively. Long term bonds were the largest gainers, rising 1.7%. The USD was the strongest currency, gaining 1.0%, while the Canadian Dollar was once again the weakest, giving up 0.7%. Long term bonds rose 1.7%, while short term bonds gained 1.0%. Bitcoin and Ethereum followed similar patterns this week, falling hard on Sunday the 17th, recovering slowly until Friday, when they (along with many other asset classes) were slammed, ending the week down 14.5% and 17.5% respectively. European stocks were the only equities to close lower, falling 0.6%. The S&P 500 saw the largest gains, rising 1.0%, followed by the Japanese Nikkei Index, which gained 0.7%. Gold stocks rallied 0.5%. Copper and cotton here hard hit, dropping 3.5% apiece. Silver is listed as rising 4.1%, but this is a statistical anomaly. The London silver fix used in my database was issued just before the trade war stories hit the news wires on Friday, causing all the precious metals (and many other asset prices) to fall sharply. Using the New York closing prices for gold and silver gives a silver price of 0.402 grams/oz, for a gain of 0.42% for the week, a more fair assessment. That would make platinum's 0.7% gain the largest among the commodities. 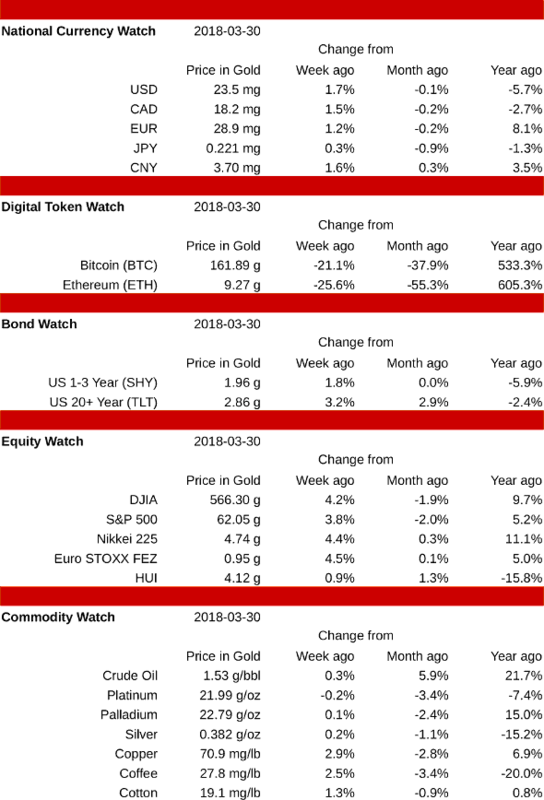 This was a good week for stocks and cryptos, a bad week for bonds, and a mixed week for currencies and commodities. The biggest changes were in commodities, as copper rose 6.2% and coffee dropped 4.7%. Ethereum closed the week up 3.3%, but the crypto markets fell hard over the weekend, with Ethereum down 12% on Sunday. The Euro was the strongest currency, gaining 0.6%, while the Canadian Dollar was the weakest, giving up 0.4%. Long term bonds fell 0.9%, while short term bonds and USD cash each fell 0.3%. Bitcoin and Ethereum were both fairly stable throughout the week, closing up 0.8% and 3.3% respectively. Over the weekend, however, both saw large drops on low volumes, closing down 10 to 12% on Sunday. Several explanations have been floated, including the hack of Coinrail, a small Korean exchange, and fresh concerns about CFTC investigations into crypto price manipulations. Gold stocks were the only equities to close lower, falling 0.5%. The Dow Jones Industrials led the field, rising 2.5%, followed closely by the Jappanese Nikkei Index, which gained 2.3%. The real fireworks were once again in commodities. Copper rose 6.2% while coffee dropped 4.7%. Precious metals were mixed, with palladium up 2.1%, silver up 1.5%, and platinum off 0.5%. Crude oil fell slightly, giving up 0.4%. It was generally an up week for currencies and bonds, but mixed for cryptocurrencies, stocks, and commodities. The largest swings were in commodities, with cotton climbing 5.3% and crude oil falling 2.4%. The weakest currency was the Chinese Yuan, off 0.1%. The Canadian Dollar was strongest, rising 0.9%, followed by the Euro, which was up 0.8%. Short term bonds rose 0.6% while long term bonds gained 1.3%. Zero-maturity USD cash added 0.7%. Bitcoin sagged early in the week, hitting a low of 170.3 grams on Monday, but recovered to close the week at 181.2 grams, up 1.5%. Ethereum followed a similar pattern, hitting a low of 12.3 grams on Monday, but it's recovery wasn't as strong, leaving it 0.5% below the prior week's close. US stocks showed strength this week, as the S&P 500 gained 1.2%. The Japanese Nikkei index fell 0.8%, and the European STOXX 50 index dropped 0.5%. Gold stocks were little changed, up 0.1%. Cotton continued its multi-week rise, gaining another 5.3%. Coffee also rose strongly, adding 2.7%. Crude oil saw the week's largest decline, falling 2.4%. Metals were mixed, with silver down 0.8% and palladium up 2.0%. Platinum was little changed, up 0.1%. 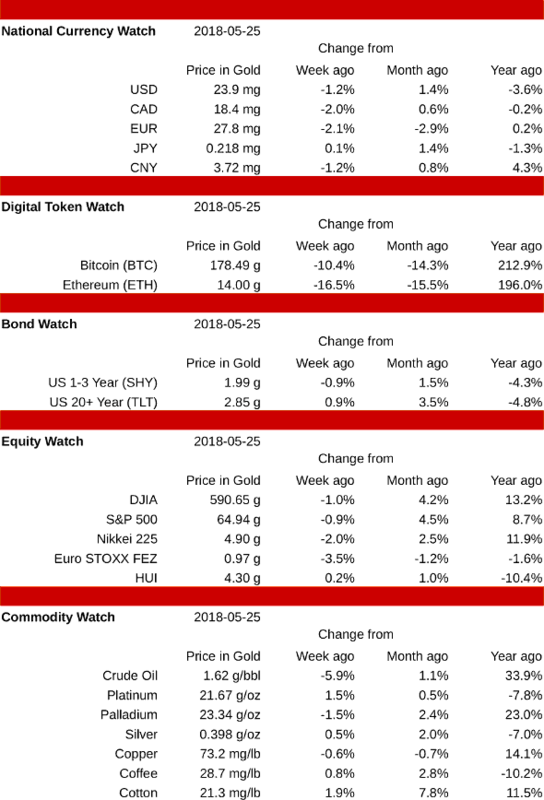 Cryptocurrencies, national currencies, and equities were mostly lower this week, while bonds and commodities were mixed. The largest drops were in Ethereum and Bitcoin, which closed down 16.5% and 10.4% respectively. The largest gains were in cotton and platinum, which rose 1.9% and 1.5%. The Euro fell more than any other national currency, giving up 2.1%, followed by the Canadian Dollar, which closed off 2.0%. The best performing currency was the Yen, which was little changed, up 0.1%. Bonds were mixed, with the long term TLT up 0.9%, while the short term SHY fell 0.9%. USD cash was down 1.2%. After a brief pause the prior week, cryptocurrencies resumed their downward move. Ethereum rose early in the week, then dropped sharply, closing at 14 grams, off 16.5%. Bitcoin followed a similar path, ending the week at 178.5 grams, off 10.4%. Contributing to the declines were reports of a hack on Tuesday on the currency Verge. This attack, while technically fascinating, had no direct implications for Bitcoin, Ethereum, or most other cryptocurrencies; but that didn't stop it from adding to the general level of Fear, Uncertainty and Doubt. All the major stock indexes closed lower; only the gold stocks managed a small gain, rising 0.2%. The European STOXX was hit hardest, dropping 3.5%. The S&P 500 closed down 0.9%. Outside of the cryptos, commodities saw the biggest swings. Crude oil closed down 5.9%, the largest loss. Cotton had the largest gain, rising 1.9%. Platinum and palladium reversed their usual courses, with Pt rising 1.5% while Pd fell 1.5%. Silver gained 0.5%. This was a very "risk on" week, as buyers pushed the prices of every asset class, except platinum, higher. The largest gains were in cotton, up 5.1%, and Ethereum, up 5.0%. Platinum lost 1.9%, and closed at 21.3 grams/oz, just 0.3% above its all-time lows. The US Dollar was the strongest of the national currencies, gaining 2.8%. The Euro was weakest, rising 1.3%. Bonds also rose, as the short term SHY added 2.8%, and the long term TLT closed 1.1% higher. Cryptocurrencies peaked early in the week, then worked their way lower as the week came to a close. Ethereum managed to hang on to more of its gains, finishing up 5.0%, while Bitcoin ended the week little changed, up just 0.5%. Stocks also had a great week, led by the DJIA and Nikkei indexes which rose 2.3% apiece. Gold stocks rose the least, adding just 0.3%. Commodities saw the most volatility, with cotton rising 5.1% and crude oil gaining 3.6%, while platinum had the only falling price, off 1.9%. Silver and palladium were quiet this week, closing up 0.5% and 0.4% respectively. National currencies, cryptocurrencies, and bonds were all lower this week, while equities and commodities were mixed. Ethereum dropped the most, giving up 14.5% for the week. Palladium saw the largest gain, rising 3.1%. The Japanese Yen fell more than any other currency, losing 1.4%. the Chinese Yuan dropped the least, closing off 0.3%. Bonds dropped the least at the long end, as TLT fell 0.9%, while SHY gave up 1.2% and USD cash fell 1.1%. 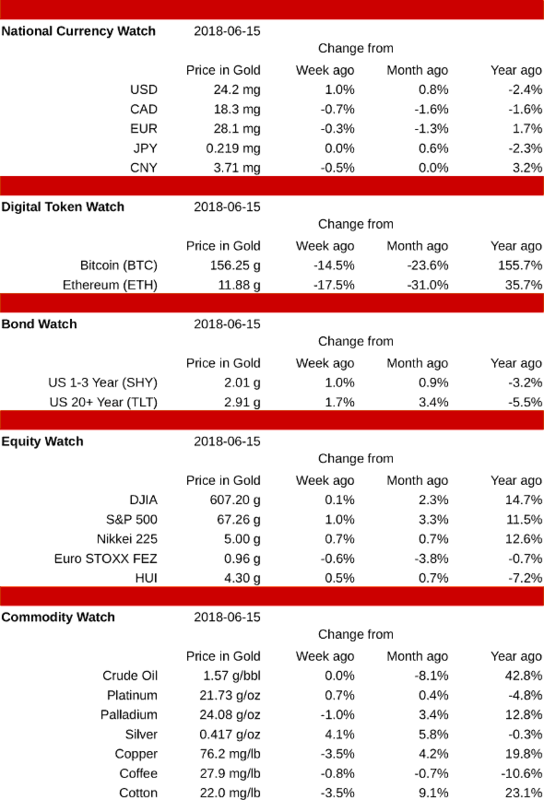 The last two weeks have been a roller-coaster ride for Ethereum, rising from 15.2 grams to a peak of 19.4 grams on May 5th, then declining gradually to close this week at 16.0 grams, off 14.5% for the week, but a bit above where it sat two weeks ago. Bitcoin followed a similar but somewhat weaker trajectory, rising from 211.5 grams to 234.2 grams on the 5th, and dropping 14.0% this week to close at 198.3 grams, more than 6% below its starting level. US Stocks were strong, as the S&P 500 rose 1.3% and the Dow gained 1.2%. The Euro STOXX 50 fell 0.6%, and the HUI gold stock index dropped 0.7%. Commodities saw the largest price moves (aside from the ever-volatile cryptocurrencies). Palladium rose 3.1% and platinum gained 1.6%. On the downside, coffee and cotton each fell 3.7%. Bonds and currencies were mixed, while cryptocurrencies, equities, and commodities were all higher. Ethereum and Bitcoin were by far the strongest assets, rising 25.6% and 12.6% respectively. The weakest asset class was long term bonds, as TLT fell 1.5%. Among the currencies, the USD rose the most, gaining 0.5%, while the Canadian dollar had the largest drop, falling 0.4%. The Chinese Yuan was the only other decliner, giving up 0.2%. Bonds were mixed, with the long term TLT falling 1.5%, while the 1-3 year SHY rose 0.4% (but was outperformed by zero-maturity USD cash). For the second week in a row, cryptocurrencies powered higher, leaving all other asset classes in the dust. Ethereum surged 25.6%, with most of the move happening in the last half of the week. Bitcoin rose "only" 12.6%, following the same pattern. Stock indexes all rose, led by the Nikkei, which gained 2.1%. US stocks were the weakest, with the Dow Jones Industrials rising 0.9%. Gold stocks were also up 0.9%. Commodities were the strongest assets outside of the cryptocurrencies. Palladium rose 5.1% and silver gained 4.2%. The weakest commodities were coffee, up 0.9% , and platinum, which added 1.0%. Copper rose 2.4%. 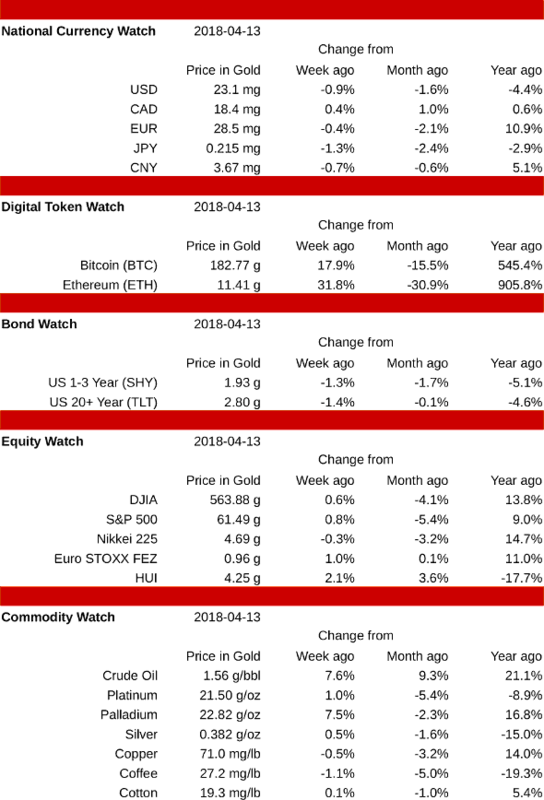 Cryptocurrencies rebounded strongly this week, while national currencies and bonds were mostly lower, and stocks and commodities were mostly higher. The biggest gains were in Ethereum, which rose 31.8%, while the largest losses were in long term bonds, as the TLT fell 1.4%. The Canadian Dollar was the only rising currency, gaining 0.4%. The Japanese Yen was the weakest currency, falling 1.3%. Long term bonds fell 1.4%, short term bonds dropped 1.3%, and USD cash declined 0.9%. The ever-volatile cryptocurrencies slammed into forward this week, as Bitcoin rose 17.9% to 182.8 grams, and Ethereum rose 31.8% to close at 11.4 grams. Each rose gradually through the week until Thursday, when they rushed higher on heavy volume. Weakness in recent weeks may be due in part to US holders (including major exchanges) selling cryptos to raise the dollars needed to pay taxes by April 16. If this is true, we could see higher prices in the weeks ahead. The only falling stock index was the Nikkei 225, which lost 0.3%. Gold stocks were very strong, rising 2.1%. The Euro STOXX 50 added 1.0%, while the S&P 500 gained 0.8%. Cryptocurrencies aside, commodities were the week's biggest winners as crude oil and palladium rose 7.6% and 7.5% respectively. Coffee and copper were the only declining commodities, giving up 1.1% and 0.5% respectively. Platinum, which hit all-time lows last week, rose 1.0% this week. Silver was up 0.5%. Currencies, cryptocurrencies and bonds were lower this week, while equities and commodities were mixed. Precious metals were hit hard, as palladium saw the largest drop of any asset class and platinum closed at a new all-time low. The best performers were cotton, copper and gold stocks, each rising 1% for the week. The Canadian Dollar was the only rising currency, up 0.4%. The Japanese Yen was weakest, falling 1.3%. USD cash fell 0.6%, about midway between short term bonds, when gave up 0.4%, and long term bonds, which dropped 0.9%. Bitcoin and Ethereum each rose early in the week, then sold off, with BTC closing down 4.2% at 155.1 grams and ETH off 6.7% at 8.7 grams. Despite these losses, Bitcoin remains in an exponential uptrend, more than doubling in value every 6 months and gaining in purchasing power relative to many other cryptocurrencies. The best performing equities were the gold stocks, which rose 1.0%. The Euro STOXX also rose, but just 0.2%. All others were lower, led by the S&P 500, which fell 1.7%. Commodity carnage was focused on oil and precious metals. Palladium saw the week's largest drop, falling 6.8% to close at 21.2 grams. Platinum declined 3.2% to 21.3 grams, a new all-time low, but higher than palladium for the first time in months. Crude oil was also hit hard, giving up 4.7%. The strongest commodities were copper and cotton, up 1.0% each. Silver sat out the worst of the damage, closing down just 0.2% at 382 mg. This was a great week for every asset class except the cryptocurrencies. Ethereum took the biggest hit, falling 25.6% to close at 9.3 grams. Bitcoin also fell hard, giving up 21.1% and closing at 161.9 grams. The strongest assets were stocks, led by the Euro STOXX 50 index, which rose 4.5%, closely followed by the Nikkei and the Dow Industrials. The Japanese Yen was the weakest government-issued currency, gaining 0.3%. The US Dollar was strongest, rising 1.7%. Short term bonds added 1.8% while the long term TLT rose an impressive 3.2%. All the major stock indexes were very strong. Even gold stocks managed to gain 0.9%, ending the week at 4.1 grams. Oil and precious metals were little changed, ranging from platinum's 0.2% loss to crude oil's 0.3% gain. Copper was the strongest commodity, rising 2.9%. Coffee and cotton gained 2.5% and 1.3% respectively. Bitcoin is down about 2/3 from its all-time high, and sits about where it sat at the bottom of the February "flash crash", and about where it was 4-5 months ago, on the way up to the peak. It has violated the "doubling every 4 months" uptrend line, but would need to fall by another 2/3 from here to violate the "doubling every 9 months" uptrend line. This leaves a lot of room to roam while still remaining in an exponential uptrend. It will be interesting to see how far the decline ultimately goes. For those interested in switching out of Bitcoin and into other cryptos, rather than banking profits in the form of gold or government issued currencies, it is worth noting that Bitcoin has actually been rising in purchasing power recently. For instance, consider DASH: at the start of this year, 1 BTC bought about 13 DASH, while today it buys about 23 DASH, an increase of over 75%.